Celebrate the fun of riding personal watercraft with the jet ski male blonde hair personalized Christmas ornament that's available in brunette and female versions for the other riders on your list. We'll add your custom information to these hobby ornaments personalized as lasting keepsakes for each recipient. 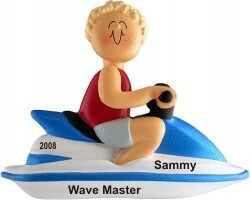 The attached holiday cord offers quick display of the male blonde jet ski rider personalized Christmas ornament wherever it looks best when received in our exclusive velvet gift and storage bag.